This work began with gouges and holes that were the remains of a previous installation that revealed the stratigraphy of the studio walls. This simple beginning suggested a range of connotations and set me off on a trajectory around the history of the wall. Above the gouges I gridded out a circular chart from an engineering dissertation, and transferred the chart by drilling holes into the wall. I was loosely thinking about imposing order and rationality (engineering chart) over chaos (gouges, holes, destruction). 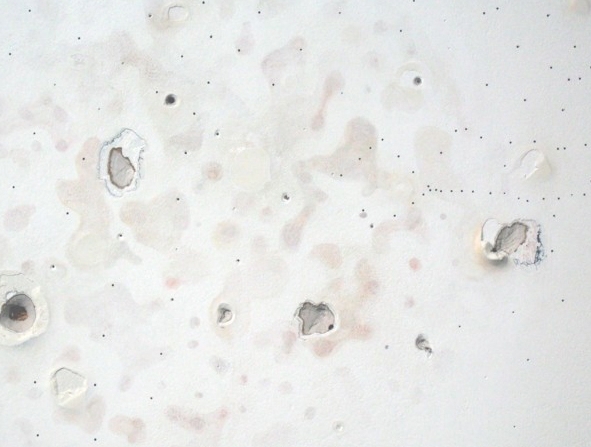 The final element is a circular area in the center of almost indiscernible painted colored patches that I thought of as mold, seeping liquids, or old stains from uncertain activity. The piece creates a constellation effect loosely connected to history, mourning, absence, change, and the mysterious order that exists even in chaos and dissolution.